Localization technology and best practices are developing faster than ever. 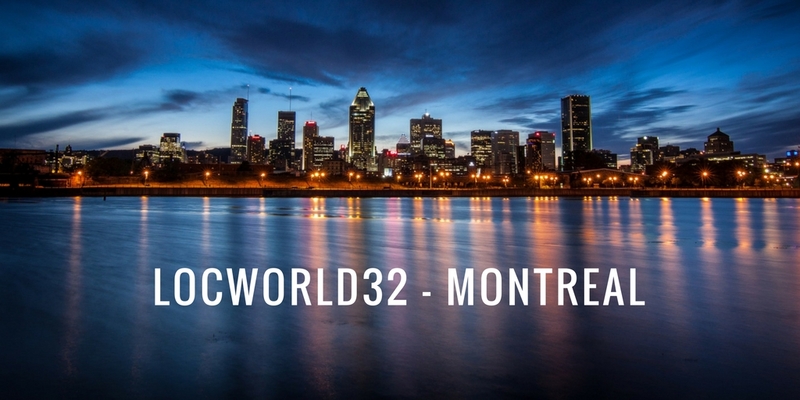 More than 500 localization professionals gathered in Montreal at the final LocWorld conference of the year and large companies such as Dell EMC, Netflix, Oracle, WB Games, and Pitney Bowes shared new challenges and tricks in bringing businesses to global audiences. Enterprises are looking for more ways to track localization ROI and to change the perception of localization as a cost center to a revenue generator. Localization managers are looking for more data and metrics to make an impact on business, such as the cost of translation, productivity savings, analysis of localized content, and opportunities for new markets. The challenge will be turning the ocean of translation data into actionable business intelligence. 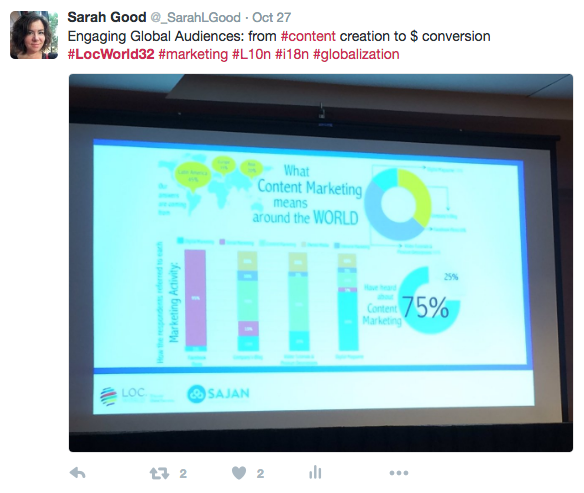 The integration of marketing and localization was a takeaway from LocWorld Dublin in June and the theme reemerged in Montreal. Content translation and multilingual SEO are a focus for global marketing teams. Which languages should be added and which should be dropped? Metrics and data are going to be crucial in the future. Representatives from Adobe discussed the challenges and strategies with localizing support page content as well as marketing content. Netflix expanded its content globally in January of 2016, adding 130 countries and increasing to 21 languages. While most of the countries were added with English, Localization manager Katell Jentreau highlighted an increase in country activity in September when they localized content into Polish and Turkish. Rotary International has centralized social media communication teams with smaller teams around the world focusing on localized content for that area. Which content should be localized from the centralized team and which content should be created organically from the local teams? Machine Translation is constantly improving, and the latest technology shows a trend towards the more human-like Neural MT. Google deployed their version with two language pairs just a week before Systran deployed their own version with 38 language combinations. Google received all the hype, however many people are working on Neural MT. According to Systran, the first results of NMt engines are good. At the TAUS conference in October, they reported higher fluency and are now testing to see if neural MT or statistical MT are more accurate. Additionally, it takes a much smaller corpus to build a viable engine, so 3 million translation units is enough, according to Systran’s JP Barraza. This could be a game changer to long-tail and dying languages, or for specialized corporate language. Neural engines could be the new generation of MT technology, and the next steps for MT developers around the world. 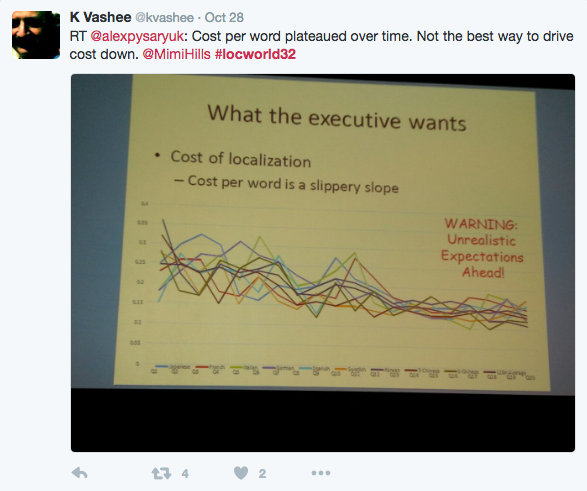 As Machine Translation continues to advance, there is conversation surrounding the future role of the translator. Some are hesitant to use MT too much to prevent losing the “human touch” to translation. Others see MT as a tool to be used to speed up translation, and the translator’s role is an elevated and more valued role for translation and the increasing trend of transcreation. Continuous Localization discussion are switching towards customer experience and continuous user experience, however, the tools and the processes are not there yet. In the future we might see a translation process without projects and jobs, a stream of separate segments and context information, but currently people are sticking to more traditional methods while constantly pushing for faster turnaround times. 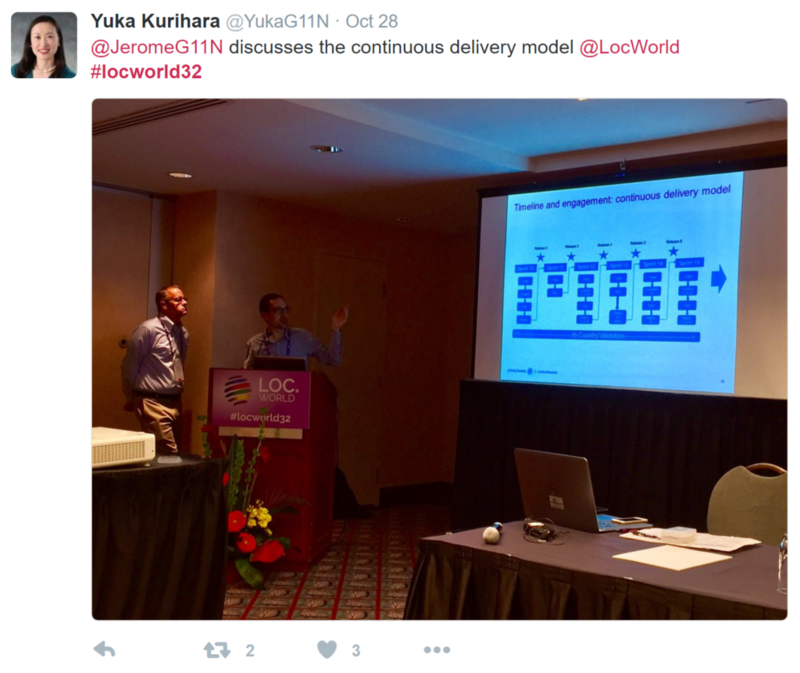 The next LocWorld will be in Shenzen, China on February 28 - March 2, 2017 with the theme of Continuous Delivery. We’re looking forward to the next round of sessions, learning more about these and new trends, and seeing familiar faces.